NOTE: Just to be clear, this post does not describe any established theory. It was intended as a thought exercise to elicit feedback (with no results so far). What it describes may or may not be accurate — it does seem logical to me, but I am not an expert on the banking system. UPDATE 11/11/2010: Thanks to commenter Ramanan for pointing out that the concepts in this post overlap to some degree with existing Post Keynesian / Circuitist work, such as by Marc Lavoie. UPDATE 4/28/2011: If you read this post and are interested in further details including a graph of QE's impact on bank versus non-bank lending in the US, please also read this more recent post. Two fundamental types of lending enable the private sector to borrow money. The first type is bank loans, which "create money". The second type is other lending in all its forms, in which a lender (typically not a bank) lends existing money to a borrower. Sometimes loans of existing money are directly between two entities, for example a household buying a bond issued by a corporation. Other times they go through a lending intermediary that pools together loans, for example securitized loan pools sold to investors, or Fannie Mae and Freddie Mac with their mortgage assets and "agency debt" liabilities. There is even a fledgling peer-to-peer lending industry that can involve either direct person-to-person loans or intermediary loan pools. This post will explain how an economy with both forms of lending on offer allows the private sector to partially self-determine the broad money supply (i.e., according to its preference for holding liquid short-duration assets), semi-independently of the amount of private borrowing it desires. I have never seen this idea explained elsewhere before, so please comment below if you have seen it addressed elsewhere, or if you think my logic is incorrect. One important conclusion of this is observation is that if the government attempts to force the private sector on aggregate to hold a larger quantity of money (short duration assets) than the private sector wants, then the private sector, given enough time, will counter the government's action by shifting from bank loans to non-bank loans (e.g., bonds), thus eliminating the increase in the money supply. Conversely, if the government offers insufficient short duration assets, the private sector will tend to favor bank loans (with their associated money creation) over non-bank loans, until the money supply increases enough to satisfy the private sector's liquidity desires. This conclusion also has implications for what to expect from quantitative easing. QE is nothing more than an asset swap that replaces long duration assets held by the private sector with new short duration assets (issued by the central bank). Modern Monetary Theory (MMT) authors have been saying this for years, and Paul Krugman has finally figured it out too. So, given enough time after quantitative easing and small enough frictions and impediments between the two types of lending, we should expect to see a relative reduction in bank lending (via money creation), and relative increase in other forms of lending (without money creation) as the private sector tries to eliminate its excess short duration assets ("money") by shifting into longer duration assets (e.g., newly issued bonds). Thus yet another reason QE is a non-event for the real economy! Other authors have already shown that it will not cause any increase in bank lending (the money multiplier is a myth for today's currency systems!) But will QE even reduce long term interest rates? There is little evidence that it will. Long term rates rose during the Bank of England's recent QE program. James Hamilton, a frequently linked to traditional economics professor, summarizes estimates of the effects of Fed's QE at less than a 20 basis point reduction in long term yields, a trivially small amount that may also represent coincidence. In fact, an implication of the theory explained above is that QE could actually accelerate the shrinking of banks' loan books, and aside from fee income from banks facilitating other types of bond-like lending, banks could actually be hurt by QE via the loss of expected loan income as loans are packaged into securities for yield-hungry investors or refinanced into bonds. Does history show any evidence of this effect? 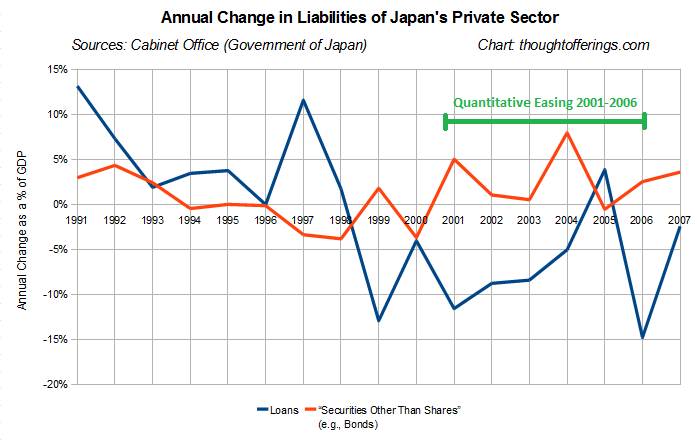 Japan first experimented with a form of quantitative easing from 2001-2006. 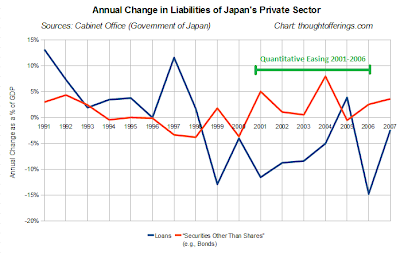 Here is a graph showing two types of liabilities summed up for Japan's private sector — loans and "securities other than shares" (which I am assuming are largely longer-duration liabilities such as bonds, but I am no expert on Japan's national accounts data and could be wrong on this). Funding via "securities other than shares" (bonds, etc?) (red line) jumped to positive growth during the QE period, even amidst ongoing contraction in bank loans (blue line). If deleveraging was ongoing, absent other factors, shouldn't it have been ongoing in both categories? It seems this data might lend some support for the idea that a forced increase in money might be counteracted by the private sector favoring bond-like lending over bank loans to reduce the balance of unwanted money in the system. First let's look at the difference between a bank loan and other forms of lending, then at how interest rates are determined. The following images are snapshots from a slightly edited (for demonstration purposes) copy of my Macroeconomic Balance Sheet Visualizer. You can try the "Bank Loan" and "Private Bond Issued" operations there yourself, as well as the "Bank Loan Is Securitized" operation (not shown here). As you can see, loans create deposits (this is widely misunderstood, as people assume that banks lend out reserves, which is not true). Because of the way the central bank ensures sufficient reserves in the system to satisfy reserve ratios (though these ratios don't even exist in many countries), the only limitation to bank lending is finding enough credit-worthy borrowers and meeting capital ratio requirements. The capital requirements dictate how much balance sheet equity a bank must have relative to its loan assets, since such equity is a "cushion" for absorbing losses. Banks can generally raise more capital as needed if there are worthy borrowers, so this is no limitation either beyond the very short term. In both cases, the borrower's balance sheet adds a new short duration asset (money) and a new long term liability (loan or bond). In both cases, the lender's balance sheet adds a new long duration asset (loan or bond). For a non-bank lender, adding the long duration asset requires giving up a short duration asset (money). For a bank lender, adding the long duration asset requires adding a short duration liability (bank deposits, which are money for the depositor). In both cases, total private sector debt is increased. Only in the case of bank lending is the broad money supply increased. So the KEY difference from a lender perspective is that bank lending requires accepting a new short duration liability, while non-bank lending requires giving up a short duration asset. What interest rates would banks offer on loans compared to rates offered by non-bank lenders? In both cases, interest rates have to be sufficient to cover credit risks (i.e., the risk of borrowers defaulting on their debt) and inflation and interest rate risks. On top of this, a bank lender has to price in the ongoing cost of the new liability (paying interest to the depositor), while the non-bank lender has to price in the opportunity cost of the foregone short duration asset (money). At any given point in time, both these costs will be the same, since both the liability and the foregone asset pay interest at the current deposit rate on offer by banks. So, based on these factors alone, bank lenders and non-lenders should offer comparable interest rates to borrowers at any given point in time. So which would "win" in lending to prospective borrowers? At times when there is a surplus of short duration assets (bank deposits) in the system (i.e., "too much money"), some non-bank lenders will be more eager to trade short duration assets for longer duration assets, and will likely bid down the lending rate and out-compete the banks. This will limit the increase in the money supply as non-bank lending doesn't create money. Conversely, at times when there is a deficient amount of short duration assets in the system, non-bank lenders will want to hold onto the deposits they have, so they will not match the lower lending rates offered by banks, and will thus let banks extend the loans to borrowers, thereby increasing the money supply. Loans would keep beating out bonds until the money supply had increased to a point of equilibrium (i.e., the amount of money desired by depositors on aggregate to meet their liquidity preferences). In this way, the ability of banks to "create money" when they lend provides an interest rate anchor for the economy (a sort of private sector "lender of last resort"). And because of this, the private sector has some control over the broad money supply, independent from the amount of debt it issues. Of course the whole dynamic posited here would probably be a "medium term" thing, not instant, as it would take time for shifts between types of lending to occur, so in the short term, none of this may apply. What do you think? Is this (A) logical (B) flawed, or (C) an amateurish summary of some existing theory in finance or economics? UPDATE: I had intended to also mention the theory that QE will drive up asset prices (stocks, housing, etc). This post does not address that directly, but to the extent that a shift away from bank loans occurs and counteracts the increased "unwanted" money supply, some of the driver for such an effect on asset prices might disappear (in the medium term).